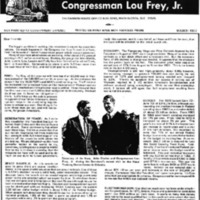 The Florida From the House...To Your Home newsletter mailed to citizens of the 5th Congressional District of Florida, represented by U.S. Representative Louis Frey, Jr. (1934-), who served in the U.S. House of Representatives from 1969 to 1979. Rep. Frey was on several committees during his time in office, including the Select Committee on Narcotics Abuse and Control and the Science and Technology Committee. He was also the chairman of the Young Republicans of Florida. The newsletter also discusses President Richard Nixon's (1913-1994) Temporary Wage and Price Controls of 1971, the U.S. economy in general, as well as the federal budget and campaign reform. The newsletter also states Rep. Frey's concerns over the condition of Lake Apopka, and his efforts with Reps. Don Fuqua (b. 1933) and William V. Chappell, Jr. (1922-1989) to form the Ocklawaha Basin Improvement Council, an organization that would tackle the lake's pollution problems on a regional level. Additionally, the newsletter describes efforts to improvement employment in the aerospace industry in Florida, as well as describing the issues facing attempts to fight drug trafficking in Mexico during the War on Drugs. Photocopy of 2-page typed newsletter: Florida From the House...To Your Home, March 1972: binder 1972, Friends of Lake Apopka Archives, Ginn Museum, Oakland Nature Preserve, Oakland, Florida. Digital reproduction of photocopied 2-page typed newsletter: Florida From the House...To Your Home, March 1972. Originally published by Lou Frey, Jr.
Government and is provided here by RICHES of Central Florida for educational purposes only. The biggest problem in writing this newsletter is caused by space limitations. So much happens in the Congress that I can’t cover it all here. Feel free to write if I haven’t covered an area in which you are interested. Many of you have asked where we are living. After about 2 1/2 years of existing in D.C., we’ve moved home. Besides, the group that left- Marcia, Julie, Lynne, Lou, Lauren, and Folly (our Irish Setter) we’ve added Chris, born in November. Commuting by plane is only 1/2 hour more than the rush hour drive in D.C. and we’re all glad to be home. POW’s: By May of this year we will have less than 69,000 men in Vietnam instead of the 540,000 we had three years ago. As the end nears the concern for the 1500 POW’s and MIA’s continue to grow. The President has indicated that a residual force will be maintained in Vietnam and no settlement reached until the prisoner issue is settled. These men and their families have more than fulfilled their obligation to this country. We must do al [sic] we can to honor our obligation to them. Let’s keep up the public pressure in support of our fellow Americans. World opinion helps in the continuing negotiations to release our men. One thing is for sure-these men are not, will not become, forgotten Americans. GENERATION OF PEACE: As I write this newsletter the resident has just returned from China with the trip to Russia still ahead. Some controversy has arisen over these trips. Yet let us remember that our nation negotiates not from weakness but strength with full knowledge of the history of the countries with whom we are dealing. We are obligated- as the most powerful nation in the world- to try, somehow, to bring about a peaceful world. Not to try is to ensure someday that the weapons we have will be used and to default on our duty to future generations. Secretary of the Navy, John Chafee and Congressman Lou Frey, Jr. during the Secretary’s recent visit to the Naval Training Device Center in Orlando. SPACE SHUTTLE: As this newsletter goes to press there are several developments in the space shuttle situation that are about to break. One of these is NASA’s decision to use a solid fuel, water recoverable booster. This decision limits the launch site to coastal regions and brings us one step closer to the site selection which we expect by June. Studies have shown that we will save over $10 billion in the next 15 years through its use for both manned and unmanned flights. This low cost transportation system can be developed without increasing NASA funding over the current 3.38 billion dollar [sic] budget which is about 1.3% of the Federal budget. When people talk about cost they should know that in terms of our gross national product, 1.8% of the total is spent on alcohol and 1.1% ion cigarettes while on .3% is spent on the space program. Another important plus is that many Congreesmen [sic] have visited the Cape at our invitation to see the program in action and have received follow-up briefings. Although predictions in politics are risky, I’ll go on the line predicting a sizeable victory in the House for the Shuttle. made this summer, and it is my belief, as I have said from the start, that the Cape will be selected for the initial launch site. ECONOMY: The Temporary Wage and Price Controls imposed by the President in August of 1971 were tough medicine. Many of us view these controls as a last ditch effort and a necessary evil. But the economic facts of life showed a change was needed. It appears that the medicine has the patient back on his feet. The consumer price index rose at an annual rate of 17% from August to November 1971. This is the lowest rate in the last 4 1/2 years. Unemployment is still too high – presently about 5.9%; however, the economy managed to generate 790,000 new jobs during the last quarter of 1971 and unemployment among married men dropped to 3.8%. There’s no question that our success in getting out of Vietnam resulted in 2 1/2 million Americans (ex-servicemen and defense workers) being unemployed. While no one likes unemployment, I believe all will agree that full employment resulting from war is not the answer. BUDGET: The 1973 budget (July 72-June 73) of $246.3 billion, although representing the smallest increase in Federal spending since 1965 has a sizeable deficit of about 25 billion dollars. From 1965 to 1968 government spending increased by 17% per year. From 1969 to 1972 it increased by about 9% per year. This year’s increase of 4.1% is the lowest budget increase in recent years and is a step in the right direction. It’s important to note that 71% of our annual Federal budget is relatively uncontrolled or locked in the budget by existing law. As an example, $68.1 billion is required to fund the Social Security Trust Fund. Additionally, if we hadn’t reduced Federal personal income taxes, the budget could be balanced. This year individual taxpayers will pay $22 billion less than in 1968. A family of four which made $7,500 in 1968 paid $756 in income tax. This year the same family will pay $484 or $272 less in taxes. Interest on our national debt is about $21 billion per year and increased at the rate of $43,000 per minute. Remember this- the president can’t spend one penny. It’s Congress that can appropriate this money. Congress must be more responsible so we can live within our national income. ELECTION REFORM: Our election machinery has been under attack- and for good cause. In 1970, Senate, House, and gubernatorial candidates spent over $60 million on their races. It seems to many that victory goes not to the most qualified but to the candidate who spends the most and literally buys the election. The last federal election reform legislation which passed in 1925 was meaningless. For example, the there was no requirement that a candidate for Congress disclose where he received his contributions or how the money was spent. THE ENVIRONMENT- OKLAWAHA: In my last newsletter to you I mentioned the problems of Lake Apopka. As you all know, ten years ago Apopka was a thriving bass fishing area in the southeast. Today it is nearly dead. Unfortunately, this problem is not localized to Lake Apopka alone. The entire Oklawaha River Basin is being threatened. This is why I asked Congressmen Bill Chappell and Don Fugua to join with me in attacking this problem on a regional level. We are concerned over the continuing water pollution in the basin and feel that the establishment of a regional council to cut through the red tape would be more economical as well as effective. For the last four months we have been working on this problem and are now in the process of establishing the Oklawaha River Basin Improvement Council. All interested parties will be represented on this 24 member [sic] council which will coordinate efforts to find an equitable solution to this problem. We hope the council will be operational by late Spring. RETRO, UNEMPLOYMENT & WAGES: In January of last year, the problems of the aerospace workers in our district were getting worse. Over 7,000 scientists, engineers and technicians were reported unemployed while these figures did not include those who had taken jobs as pizza pushers, printers, etc. This is why we decided to establish RETRO- a Regional Environmental Training and Research Organization. With the help of Brevard Community College, Florida Technological University, and Florida Institute of Technology, a retraining program finally emerged which was designed to retrain scientists and engineers as well as technicians. In addition [sic] a placement program was established which would search for available jobs to insure placement after the retraining had been completed. We took this idea to many different governmental agencies and explained that this retraining would be for positions in the environment- retraining in such areas as air, water and land pollution as well as jobs to help local communities in planning hospitals and mass transit systems. Over the last year we have managed to obtain over $2.4 million in RETRO related funding, including $598 thousand from the Department of Labor for job search and placement activities and $1.17 million of Emergency Employment funds to hire the unemployed in Brevard and Orange counties. In addition, approximately 78% of those trained have been employed or are presently continuing their education. Only 22% are still in the process of being interviewed for employment. One of the major problems on which we have been working is the “wage busting” situation in Brevard County. We felt a wage determination should be made under the present law and after repeated attempts to persuade the Department of Labor to make this decision our efforts were rewarded. Just before Christmas, the Secretary of Labor, James Hodgson, made the announcement that a determination was being made and that a minimum wage rate would be set for workers on government contracts. This wage rate was to be equal to the prevailing wages paid in the community for the same type of work. The effect of this decision has gone a long way toward limiting the “wage busting” problem in Brevard, and I’m glad the Secretary agreed with us. DRUG TASK FORCE: During the past months our work on the problem of hard drugs has continued. Our recent hearings in Miami indicated that about 50% of the heroin and cocaine coming into the U.S. passes through Florida. At the request of the White House we went to Mexico and then later to South America to see what, if anything, could be done. About 15% of the heroin used in the U.S. is grown in Mexico. We wondered why all the fields weren’t destroyed…but soon learned. The poppy grows in vast uninhabited areas on the sides of mountains 7 to 10 thousand feet high. The federal troops try to destroy the filed but have unbelievable logistic and transportation problems. In the District I visited there is only one helicopter and one pilot who flies seven days a week, seven to ten hours per day. His helicopter is shot at continually (as we learned) and his pay is very low. The troops have to walk for seven to eight days from their base just to get to the poppy fields. We discussed this problem with the Mexican Attorney General and stressed the need for better training, equipment, and cooperation. Some South American countries (unlike Mexico) have less of desire to do something about the drug traffic. First, these countries do not have an active hard drug problem among their own citizens, and second, they have economic problems and can’t afford to put money into law enforcement, equipment, or training to prevent the flow of drugs. The potential for corruption of public officials is increased by the low salary scale. The very size of the continent (Brazil has ten borders) compounds the problem. Shown here is Jules Bergman of ABC News as he filmed a favorable report on Congressman Frey’s Project RETRO just prior to the launch of Apollo 15. A similar report appeared in Newsweek. Each year we have a booth at the Central Florida Fair and ask that our visitors answers questionnaire. Here are some to the results from this year’s survey. Apollo 15; BC News; BCC; benzoylmethylecgonine; Bill Chappell; Brevard Community College; budgets; Cape Kennedy; China; Chris Frey; cocaine; Coke; colleges; Congress; deficits; DOL; Don Fuqua; drug task force; drug trafficking; drug wars; drugs; educational Florida Institute of Technology; election reform; FECA; Federal Election Campaign Act of 1971; FIT; Florida Technological University; FTU; heroin; James Day Hodgson; John Chafee; John Lester Hubbard Chafee; Jules Bergman; Julie Frey; Lake Apopka; lake restoration; Lauren Frey; Lou Frey; Lou Frey, Jr.; Louis Frey, Jr.; Lynne Frey; Manned Spaceflight; Marcia Frey; Marcia Turner; Mexico; MIA; Miami; missing in action; narcotics; NASA; National Aeronautics and Space Administration; Newsweek; OASDI; Oklawaha River Basin Improvement Council; Old-Age, Survivors, and Disability Insurance; Oscar Flores Sánchez; outer space; poppies; Poppy; POW; price controls; Prisoner of War; Regional Environmental Training and Research Organization; RETRO; Richard Milhous Nixon; Richard Nixon; Russia; Social Security; Social Security Trust Fund; Space Shuttles; Temporary Wage and Price Controls; U.S. Congress; U.S. Department of Labor; U.S. House of Representatives; U.S. Representatives; U.S. Senate; unemployment; universities; university; Vietnam War; wage busting; wage controls; War on Drugs; William V. Chappell, Jr.
“Florida From the House...To Your Home Newsletter, March 1972.” RICHES of Central Florida accessed April 20, 2019, https://richesmi.cah.ucf.edu/omeka/items/show/7512.